When 14-year-old Madiba Olivier finished playing Final Fantasy VII for the sixth time, the young Cameroonian took the first step towards achieving a childhood dream. His passion for the interactive medium, spurred by the Japanese role-playing game and Super Mario creator Shigeru Miyamoto, led him to establish Kiro'o Games, Central Africa's first video game studio. But how did it get its start and where does it see Africa in the contemporary video game market? Andre van Wyk finds out. The company's name is derived from the Swahili "kiroho maonno" meaning "spiritual vision". In 2003 Olivier founded the then-named Madibao Corporation Studio, with Yakan Dominique and Waffo Hugues, and over the next decade, the studio acquired additional staff as it developed its inaugural title, Aurion: Legacy of the Kori-Odan. Several difficulties were encountered over the course of the game's decade-long development cycle, not least of which were finances. 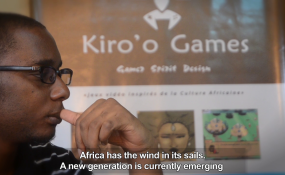 "We started the project in 2003 but it was very difficult for us to find funding in the first place," Kiro'o Games Business Director Boyogueno Roland says. "Potential investors, particularly those in Cameroon, were sceptical of the project. Thankfully, the sponsorship and support of the ministry of culture and arts got us the credibility we needed." Their concerns about financial support were further alleviated after the studio created a successful campaign on the online crowdfunding platform Kickstarter. The project gained U.S.$50,000 in support from backers. Despite this, Roland remains adamant that video game development should primarily be supported by local investors. "We invite African investors to join the movement and trust projects like ours. Video game design can be profitable and we think this will also help to motivate more African students to enter the sector." Power cuts were an additional hurdle for the team, Kiro'o Games founder Madiba Oliver says. "During the dry season we faced daily outages so we plan to use solar energy for future projects". The studio's current project, Aurion: Legacy of the Kori-Odan, is an action-based role-playing game that sees players assume control of Enzo Kori-Odan, rightful ruler of the Zama kingdom. Players utilise the "Aurion" power granted to Enzo by his ancestors and, with his wife, Erine, have to regain control of the country. The title draws its art direction and mythos from several African mythologies and cultures. Olivier elaborates: "The history of our continent is rich. For example, we took inspiration from local Cameroonian traditions, like the Ngondo festival celebrated by the Sawa people, and we also incorporated symbolism adapted from that of the Akan people of Ghana, specifically the Adinkra writing style." The studio aims to expand its operations in the future, Roland says. "After the PC release of Aurion, we will support it with additional downloadable content before we move on to making it available for consoles like PlayStation 4 and mobile. In the next ten years we also hope to expand our offerings to include media like cartoons. The business plan has already been drafted." With this in mind, Olivier is confident about the future of video game design in Africa. "Our continent is rising and it is important that as young Africans we contribute to its development."